The many years of hopelessly searching for an upscale Italian restaurant to rival Delfina finally led me to the doorstep of SPQR. Actually, because the entrance is so nondescript, I walked by the place two times, in the rain, before realizing it was what I was searching for. But, when I walked in, I knew I was in for an amazing experience. The atmosphere is a perfect example of what I think of when I think of a neighborhood resto - cozy, dimly-lit, with a dark wood interior, and very cramped. When I came in as a walk-in, we had to wait for a seat at the bar, which only holds 8-10 places. The problem is that when it’s busy, and it’s always busy, there’s absolutely nowhere to stand comfortably while waiting, so people end up forming a row behind bar diners, eagerly waiting to pounce when someone's check arrives. Picture a pack of lions circling a helpless baby gazelle. Make a reservation. Okay, “high-minded” huh? What does that mean on the plate? It means that when you taste one of his dishes, you taste the thought process behind its creation. He’s taking the best ingredients our area has to offer, playing with flavor and texture, to create something that forces you to stop and take notice. And, unlike many other restaurants that note the names of the farms where ingredients originate on the menu, Accarrino doesn’t see the need to advertise them. Why? He explained, “Because I think it’s shameful to use anything else.” Why publish on the menu that 98% of his ingredients are organic when that should be the industry standard? Good point. Just looking over the menu makes me giddy. With so many choices, on both visits it was impossible for me to make my selections in under 15 minutes. Accarrino notes that the variety of options is both a product of his endless imagination as well as the fact that, as a neighborhood restaurant, he needs to cater to the regulars who want to come back four nights a week and try something new. Everything we ordered was beautifully plated, perfectly cooked, and well-seasoned. I didn't use salt once, which, for me, is somewhat astounding. Starting with the Spuntini, the Pork Belly ($13) stood out from the rest of the pack. Let’s be honest, pork belly is like ambrosia, and while it was perfectly crisp, juicy, and dripping with flavor, it was really its accompaniments that brought this dish to life; sundried tomatoes, olives, and gremolata, all of which have strong, distinct flavors, balance the salty richness of the belly, without any one ingredient overpowering the dish. The Fried Tripe ($6) and the Burrata ($15) are also not items that should be overlooked. The pickled vegetables served with the tripe added a touch of sweetness which complimented the spicy mayo perfectly (who knew stomach lining could be so delicious? ), while the freshness of the burrata was enhanced, not overpowered, by accompanying peperonata, watercress, and aged balsamic. All of the pasta is made in house, and is frankly some of the best pasta I’ve tried. A relatively simple preparation of Sunchoke Tortellini ($17) floods your taste buds with the taste of truffle, and the Ricotta Raviolo ($14) oozes with melted fontina cheese and burro fuso. However it was the Chestnut Nicci ($16) with spigarello (a type of green) and burnt orange sauce that proved to be the best pasta dish I've had in San Francisco in the last year. I thought the burnt orange would overpower the rest of the dish, but it was subtle and blended perfectly with the butter. It's the type of dish that forces you to stop, put down your fork, and savor. 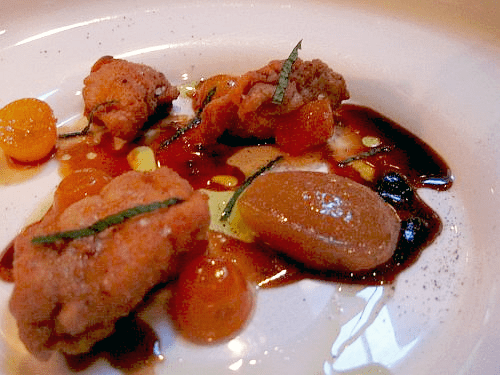 As for the Piatti, soulful Italian comfort food is tasted in the Veal Sweetbreads ($18) – crisp, little, heavenly nuggets served over braised, stew-like winter vegetables. The juicy, bacon-wrapped Rabbit ($17), resembling a sausage, is a wonderful reminder of the season when paired with gigante beans, savoy cabbage, and cranberry. And, dessert is not something you should skip. Our choices were surprising in that, when you think dessert, you think sweet, but the Ricotta Bavarese ($8) (cheesecake) with sour cherries, and the Brown Butter Torta ($8) with meyer lemon curd & Sicilian pistachio downplay the sugar while still maintaining the richness you’d expect from these types of desserts. Oh, and ask for bread – their olive oil, Francesca di Padova, is imported from the Puglia region of Italy and is so good that I almost started drinking it. With a well-thought out, lengthy wine list, and friendly, attentive service, there is almost nothing to fault at SPQR; everything about my experiences has been exceptional. And, while there is a good portion of the menu I’ve yet to try, I know that I didn’t just order well – every dish is on-point. 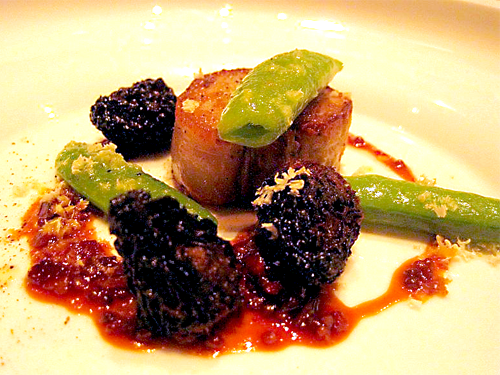 Spread the word: SPQR, with Accarrino at the helm, is a restaurant to watch in 2010.